Just wanted to do a quick post to show you guys the GORGEOUS necklace I won from Jessica at Style Obsession from Acanthus. 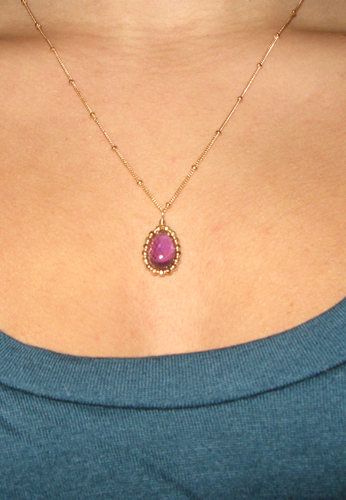 I won my choice of any Gemma necklace, and I chose the Amethyst since purple is my favorite color. The necklace is sooo pretty and so delicate! I am so excited to wear this, maybe every day ;) I HIGHLY recommend their products, they are a bit pricey but they are handmade and are just amazing! nice choice.. i adore the color. totally gorgeous necklace, so lovely and delicate! Amethyst is my birthstone and i love it! Great choice. That necklace is so versatile and wearable. Adore it! So simple and delicate, but the gold coil edge is beautiful too! Amethyst is my birthstone! I totally LOVE the color! Awesome pick! And the touch of gold simple adds up its beauty! Nice choice - I love that it's framed with a touch of gold, it really shows of the color of the stone. i love it..great choice..very pretty! that necklace is so cute!!! love it!! Gorgeous necklace! Congrats on winning! purple is my favorite color too! congrats on winning! The necklace you chose is beautiful. Definitely something you will have forever. It is precious, lucky girl!! I love this necklace. The color and shape are amazing :) Lucky! Congrats on your winning! This is lovely! Oh, it's SO pretty!! Congrats!! feel free to visit/comment on my blog, http://www.thefacelessblog.com... and follow me on google friends and bloglovin if u wish! wud love to know wot u think! congratz! the necklace is so pretty! That's a very beautiful necklace! perfect for you actually! It is really pretty, and oh so vibrant!